For many, flooring can be a boring thing to shop for, but it can create a huge difference in the space it's placed within. That said, shopping for new flooring can also prove to be a very expensive experience. Because of that, more and more people are shopping for inexpensive flooring options. These options can include things like cork, vinyl plank and laminate. Many of these options find ways to look like authentic materials without taking on the cost. To help you with finding the ideal kitchen flooring, we're going to take a look into several popular options. This flooring is a great option for those who want something soft and springy. It's a lower-cost option that is also considered to be highly sustainable and eco-friendly. 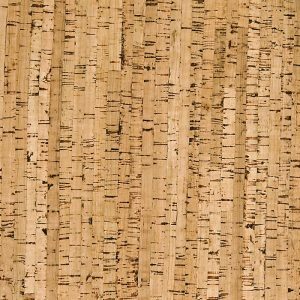 Because of that, cork has quickly become a popular option to replace types of wood flooring that tend to be more expensive. Box size: 23.17 sq. 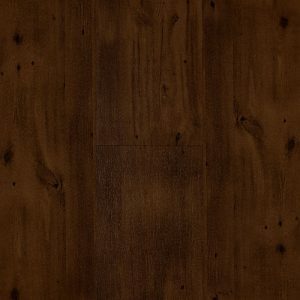 ft.
Cork is an especially good flooring type for those who want something that won't be cold in the mornings. This makes it really great for kitchens or bathrooms. 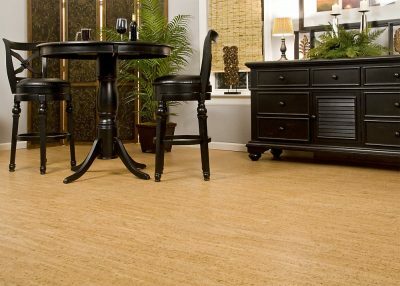 Cork flooring also tends to be soft, making it easier on your feet, joints and more. On top of that, it provides a great look that many customers have come to enjoy. Many customers appreciate that they can walk onto this floor on cold mornings and find that it remains a comfortable temperature. Many others also find it to be a long-lasting option that is easy to install and worthwhile to enjoy. For those who have a lot to cover, it's important to keep in mind that not every box may be exactly the same shade. Cork can also be somewhat sensitive to water damage, and the tiles aren't very thick. This is a fantastic, very low-cost option that works well for those who want to cover a large area without paying an arm and a leg. It's highly praised and works well for those who want the classy look of wood without the cost. 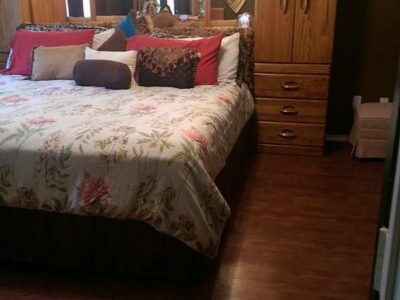 This inexpensive flooring is a great option for those who want something easy that looks great. It's made with a coating of urethane that can help to keep damage at bay, and you'll also get a 10-year warranty. Each box is able to cover nearly 45 square feet. 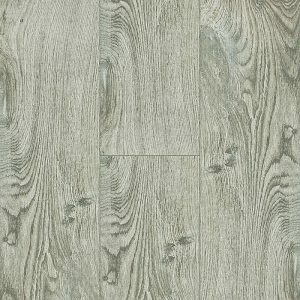 Most noticeably, this flooring has a great overall look that will work with many décor options. It's also very lightweight, making it easy to install. Furthermore, the waterproof design makes it a solid choice for kitchens and bathrooms. Because this is a low-cost option, it may not be as durable as other options. You may also find that while the 10-year warranty is great, it's not the 50 year or lifetime warranty that can be offered by other options. It can also have a little trouble with cold temperatures. 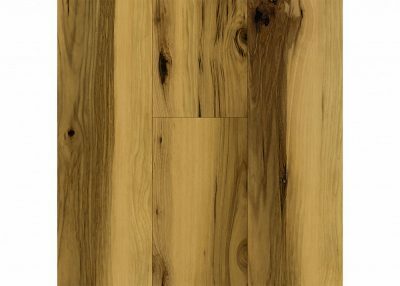 For those who want something that can brighten up their space, this Oak vinyl flooring is a great low-cost option. It has a light coloring and is made to be easy to install. You'll also get a lifetime warranty to ensure you are always happy with your flooring. While it is a budget-friendly option, this flooring is also made to be resistant to scratches and other kinds of damage that can occur on floors. It's very easy to clean and maintain while still offering the appearance of a real wood floor. It's also made to be easy to install. The appearance of this flooring is really great. It's definitely something that is going to liven up whatever room you place it in. It also uses a simple click system for installation, making it very friendly to those who prefer to save money installing it themselves. It's also low cost, so you can cover floors without breaking the bank. Because it is a thinner, lower cost option, it can be tricky to install sometimes. In some rare cases, customers can find that the planks can be accidentally damaged during the process. Because of that, it may be a good idea to purchase some extra pieces. Another lightly-colored option is the gray porcelain tile. It's a budget-friendly choice that will add a little light to the space without being too dramatic. This is a fantastic option for making your kitchen feel more pleasant and brightly lit through natural means. This flooring is designed to look authentic, but also add waterproof protection that you may not be able to get as easily from actual wood. 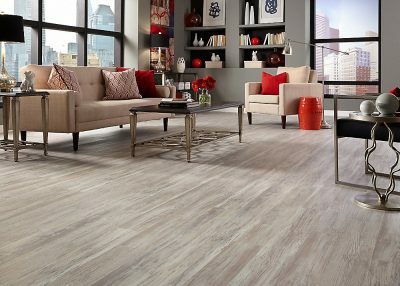 Though it's made of porcelain tile, it has the appearance of a nice oak or even driftwood type color that can add a lot to a room. Unlike many other flooring options, this option is soft and will therefore be a little easier to walk and stand on. It's also highly easy to install and maintain through typical processes. You also won't need to worry as much about water damage due to the waterproof nature of the flooring. Though it is a low-cost option, it can be a little more expensive than some others. In some cases, customers have also noticed warped tiles in the boxes they ordered, which can lead to frustration with getting everything installed well. It also might not be quite as sustainable as other options. For an extremely low-cost wood look-alike, this is a great way to go. It offers a nice hickory appearance and even comes with a 30-year warranty to keep you protected. 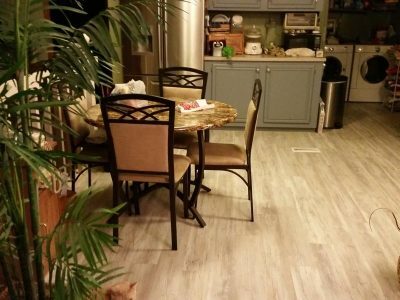 This flooring is very inexpensive and offers waterproof abilities that can keep it protected from water damage, making it great for a kitchen space. It is also made to be warmer than other flooring options, which makes it a lot more comfortable. Most importantly, this flooring has a great wood look. Because of that, you'll be able to get the look of wood with added protection against water. The 30-year warranty also ensures that you'll be covered if any damage or other issues should occur. This flooring can be somewhat thin, which can cause some difficulty during installation. It may also not be as durable as thicker flooring options. It's important to keep these things in mind and maybe purchase a little extra. Do you feel your kitchen floor can see better days? Has the shine and luster washed away after many years of usage? If you plan to make your kitchen brand new, then an easy way is to install new floor. Nowadays, it is quite easy to get kitchen flooring at any price range and as per your budget. So, it is not surprisingly that most people are opting for new kitchen flooring as it makes the kitchen great without spending a huge amount. A beautiful and sparkling kitchen adds a prestige among your friends and shows your interest in being spick and span with regard of your kitchen. 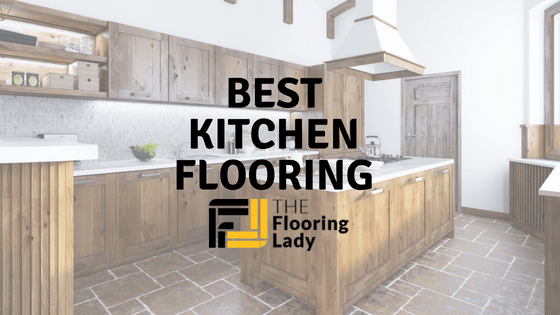 Most people know are still not aware of the various options present at their disposal for selecting the best kitchen flooring. Presently, it is not necessary for kitchen floors to be linoleum. You need to do extensive research for the various kinds of choices that are present for the best kitchen flooring. Basically, the options you have is endless in selecting what to install for your kitchen, right from laminating to stone to tile fitting. The hardest thing is the selection involved among the varieties of the flooring that you can get. Lamination comes in various colors and patterns and you can easily find the require style that easily fits to your desire and especially for your décor. You can check out wood lamination which are quite popular as they provide warmth and interest to a room and are stunning to look at. However, there are various kinds of floor lamination available online. A beautiful option for your kitchen is stone flooring. The only downside that you might come across is the expense; however, if you have a huge budget, there is no harm in choosing any of the natural stone floorings. Some of the common choices in flooring are travertine, marble, granite, etc. 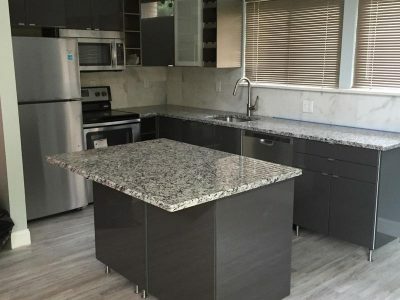 If you match the flooring with the countertops, then it is guaranteed to make your kitchen stand against the test of time. But this is possible if you properly seal them from various acid foods and different kind of stains. No doubt, tile flooring is one of the best ways to update your kitchen flooring. Quite popular ones are the vinyl, linoleum and the ceramic. 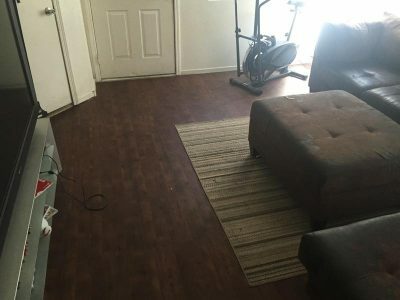 The linoleum and vinyl tiles are the least expensive ones. The stick and peel vinyl tiles makes it easy for homeowners to cement the tiles by themselves with little or no amount of problem. With regard to ceramic tiles, they are a bit expensive and even take certain amount of time to lay. But with a little amount of direction, it is easy for homeowners to install these ceramic tiles by themselves. 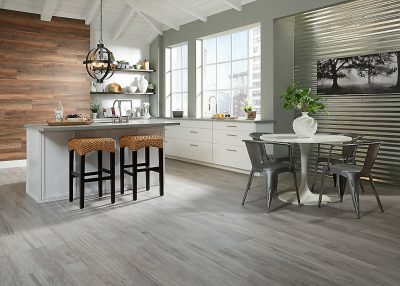 These ceramic, linoleum, and vinyl tiles are available in variety of patterns and colors, and these choices are sure to make your kitchen floor great and loveable. While selecting the kitchen flooring, it is important that you evaluate on how traffic is going on in the room. This will help you in making the required choice. Just think in this way! If your kitchen is connected to the exit or entryway, then the traffic pattern will be heavy and more when compared to being in the middle of the home. It is important for the kitchen flooring to withstand accidents and spills, and even they need to be easy to clean. Frankly, if you come across flooring that meets all these requirements, flows easily with rest of your home, and is adorable, then you have the right kitchen flooring. Now for the verdict! Kitchen is the place where you end up cooking and even do experiments for creating masterpiece dishes. Keeping it neat and tidy is great and it is even more important to make it beautiful, so that you end up spending sometime to sharpen your culinary skills. Not many people think about the variety of dishes that can be cooked and how it feels to spend time in a beautiful kitchen. True to the fact that kitchen flooring are subjected to food stains and other kind of dirt. So, it becomes your top priority to choose the material which is great and provides a life-long warranty. For the purposes of this article, the top choice is the Tranquility Knotty Oak. It offers a high amount of square footage per box and has a fantastic appearance. It's also designed to stay protected against common types of damage so that it will last you for the long term. Customers love the look, feel and the ease with which it can be installed. If the first choice doesn't suit you, each of the others have a lot to offer and can work very well for just about any preference. You really can't go wrong with any of them!